Located in Sazilly, the famous producer of high quality Cabernet Franc is making breathtaking wines of true terroir. Charles has always been a lover of the arts and is a painter and sculptor. He abandoned his passion to take over the family vineyards and start making his own wines in 1957. He in now retired and has passed on his celebration to anther generation. I tasting with Jenet, the current owner of the domaine and Kevin Fontaine, who has been making the wines for seven years. We tasted in the limestone cellars. Vineyards are spread out over 26 km in the appellation of Tourraine, with most in AOC of Chinon. The vineyards a are being converted to biodynamics for several years to express better the terroir. All grapes are destemmed. 2012 Rosé is made from Cabernet France grown on sandy soils. Expresses the red fruits from Cabernet Franc, made by saignée method, no malolactic fermentation. Kevin says of of add the ML it becomes flabby. 400 cases for the US. 2011 Chinon Cuvée Terroir. Also made from Cabernet Franc on sandy soils. This cuvée is made from grapes from the vines of Beaumont-en-Véron, along the river Vienne. The vintage was very good, healthy ripe grapes, full of fruit. Tannins are round, aromas pleasant and classic. 2011 Chinon Les Petites Roches. Soils are gravelly and clay, the texture on the wine is firmer, more defined. Located along the Vienne river, these bottlings represent the best of the terroir. Macaeration lasts about 10 days with occasional pumping over. Kevin tries to avoid extracting too many tannins. 2010 Cuvée de la Cure: 30 year old vines, matured for 5 months in used barrels followed by 5 further months in 60 hl oak tanks. Darker aromas, chocolate, mint and spice. 2011 Chinon Charmes: a 6ha vineyard that they took over in 2006, based on argilo-calcareous soil. The aging in a barrel allows for further bottle aging. The vineyard overlooks the castle of Chinon, quite windy. A mix of soils, silico-clay and silico-calcareous. The 35 year old vines produce grapes full of tannins, acid and depth of character. Aged in oak barrel for 10-16 months. Black currants, cedar, mocha and exotic pepper. The mouth is full, layered with soft tannins. 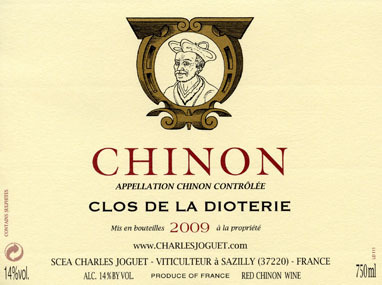 2011 Chinon Clos du Chêne verte. Soil is called, millarges, a blend of of fossils, sand stone, from a historical vineyard in Chinon. A green oak tree grew over 800 years, planted by the Abbey of Bourgeuil. The very steep slope is the first harvested over three days. The wine has a deep color, complex, supple, meant to age for many years. The oldest vineyard, over 70 years. High calcareous clayey soil, on the let bank of the Vienne. Powerful wine, almost as dark as Pomerol but higher toned fruit. The grapes get ripe and lend a softer tannin, while acid is bit lower. Yields are very low, 30hl/ha. Kevin says if you don't control the yield, the aromas can get green.